Passolento is a wine that needs time to make and evolve, without hurry. That’s how it should be drunk, in peace and in company, and that is how Alessandro and Beatrice Bonci and Daniela Quaresima want it to be. Their wine is a way of communicating the poetry of the territory to those who are fortunate enough to drink it. La Marca di San Michele, immersed in green just a few kilometers from Jesi in the Marche, seems to embrace and protect its vineyards that face the ocean, kissed by the sea breezes that rise into the hills. Alessandro and Beatrice Bonci, together with Daniela Quaresima, cultivate a bit over ten hectares. The sister, brother, and his girlfriend have three distinct personalities, but they sit close-knit and companionable with a glass of wine in front of them at the end of a long day spent in the vineyards. Daniela is always on the go. Traveling has, by now, become a part of her. Alessandro, Daniela’s partner, is of a calmer nature. But he, too, has moved around quite a bit, living in different European cities throughout his life. Alessandro and Beatrice, brother and sister, have two generations of vine growers at their backs. Their grandfather founded the winery and left the vineyards and Verdicchio production to his children. But the next generation – Alessandro, Daniela, and Beatrice – have taken a different road made of dreams, love, politics, and travel. Daniela and Alessandro were born in 1969 and 1970, respectively. Friends since the beginning, it felt natural that they both moved to Bologna to begin their studies together, Daniela in languages and Alessandro in economics. Alessandro’s sister Beatrice worked in the family winery, gaining experience in the vineyards and in the cellar. Bologna opened new windows onto the world of politics and philosophy for the two, and their friendship blossomed into love. But staying in one place proved difficult for them, and a few years later they found themselves in Dublin; then Paris. They finally returned home in 2006. Nostalgia called, and they felt the need to build something back home to express themselves, their goals, and their desires. Alessandro and Daniela, together with Beatrice, decided to take on their part of the family land. They converted six hectares of Verdicchio into organic cultivation. Their desire to produce organic wines comes from a natural continuity of their past, a way to apply a philosophy they had embraced years ago. It is a way to live a healthy life close to nature. For the two siblings and Daniela, the return to their homeland was almost an imperceptible closing of a circle that allows them to rediscover tradition – but with an innovative spirit that has evolved with their travels. For the three anomalous winemakers, making good wine is almost like following a stream of thought. They offer a drink that inspires higher awareness of the land that is tied to their wine and to the people behind it. Wine is a means to awaken the sensibilities of those who drink it, in an artistic and cultural sense, as well. With this spirit, they created the Passolento Verdicchio riserva. Passolento is produced after aging for eight months in large barrels that have already been used eight times; and another nine months in the bottle. Daniela affectionately calls Alessandro “our French spirit,” while he replies that he simply wants to make “real Verdicchio,” the wine that he remembers from the days spent in the cellar with his grandfather. It is a wine that speaks of months spent in wood, in an osmosis of flavors and aromas. 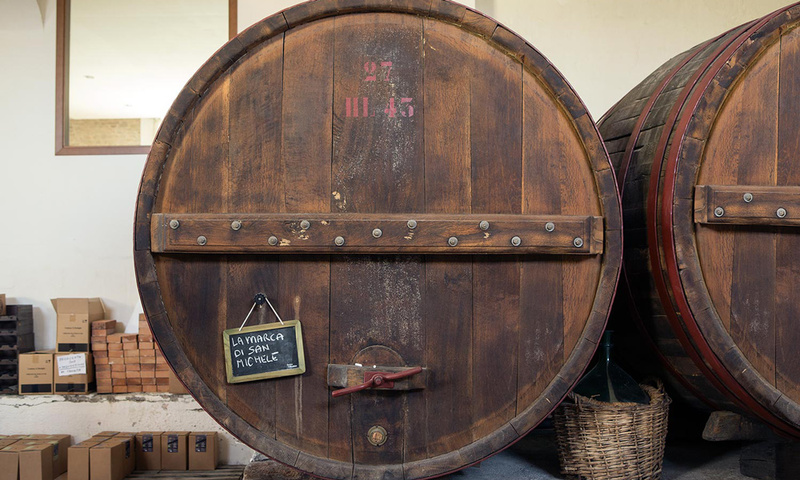 While they pour us a drink, they explain that aging their wine in used barrels follows traditional Verdicchio production; though they use smaller barrels for greater elegance and finesse. 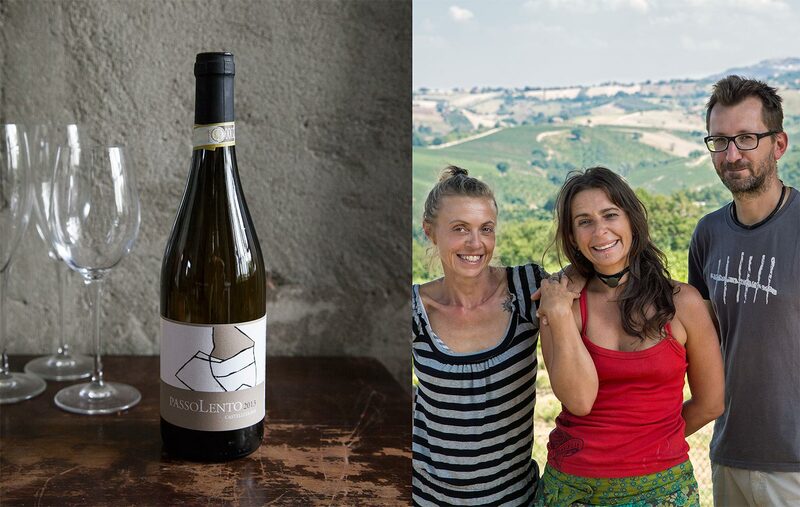 They explain why the wine is called Passolento, or “slow step:” it is a white wine made from a slow, gradual aging, just like the best reds. When you taste it, you’ll understand the wine, and you’ll understand its producers. Cheers, folks.